They've appeared in Texas, Ohio, Missouri, Tennessee, California, and New York; cloaked in stark red robes and white bonnets, the women sit in silence with their faces turned down, subdued and still yet quietly creepy. On Tuesday, the handmaids went to Washington: over a dozen women dressed in costume circled the Capitol in protest of the Senate Republican health care bill that would strip Planned Parenthood of funding and block Medicaid patients from receiving health care at the clinics. While a new television show has brought Margaret Atwood's dystopian sci-fi book "The Handmaid's Tale" newfound popularity, women around the country are bringing handmaids to life — and to their state capital buildings — for reasons that have more to do with science than fiction. At the New York state legislature in Albany last Wednesday, handmaids appeared for the third day in a row to silently urge lawmakers to bring a floor vote on two reproductive health bills they say would protect women against potential federal restrictions many fear the Trump administration could bring. Vanessa Giraldo, a Brooklyn resident who works with special-needs children, took two days off work to take part in the demonstration Monday and Tuesday. "We’re trying to pass the Reproductive Health Act in order to at least protect New Yorkers because the federal landscape is very hostile to women’s reproductive rights," said Giraldo. Giraldo said that standing before her state's leaders stock-still in the restrictive garb was "terrifying" but powerful: "It felt like, this could very well be our future. And it’s definitely our past." In Atwood's dystopian novel — and the Hulu show based on the book — handmaids are slave women forced to serve as reproductive vessels for powerful but infertile elites. Ritually raped and made to become pregnant over and over, the handmaids are little more than walking wombs with no say over their own lives. "The Handmaid’s Tale is based on what actually has happened to women throughout history, where women have been essentially narrowed down to their reproductive abilities," said Stephanie Craddock Sherwood, executive director of the Ohio abortion fund Women Have Options (WHO). Sherwood crafted the white bonnets worn by activists in Ohio who entered the statehouse in Columbus on June 13. She said her group banded together with other reproductive rights organizations, like NARAL Pro-Choice Ohio, to stage the silent protest against a bill that would effectively ban abortions after 13 weeks. 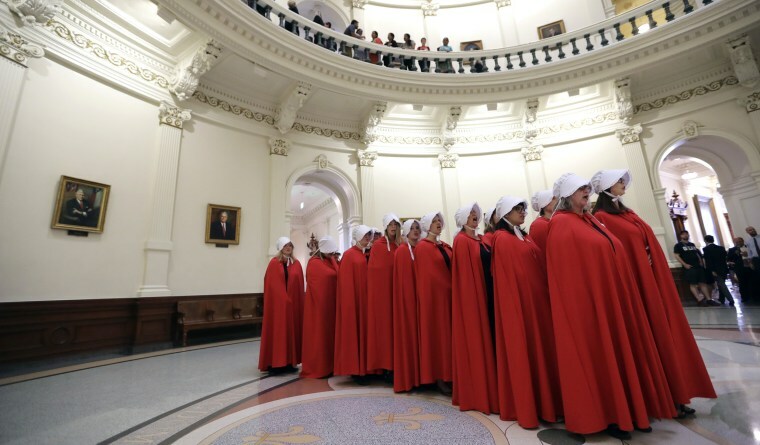 The tactic of dressing like handmaids to observe legislative debates and votes on women's healthcare started in Texas this March, where NARAL Pro-Choice Texas director Heather Busby got the idea from watching actors promote the Hulu show on the streets during the South By Southwest festival. A 'Texas Handmaids' Facebook group was created to organize the first demonstration, at a March 20 state senate debate on two abortion-related bills — one would ban doctors from performing dilation & extraction procedures, while another would give doctors permission to lie to a pregnant patient about fetal anomalies if they thought she might consider an abortion. "I was nervous at first about whether it would work, would people understand or would they think it was some kind of red riding hood thing. But they got it," said Busby, who has since helped organize sewing parties to create more of the red cloaks. Busby said the handmaids next scheduled appearance is July 18th, the first day of a special session called by the Texas governor to debate a bathroom bill that would restrict access for transgender people. Expect to see handmaids popping up outside of the U.S. soon, too: Sherwood said that she was recently contacted by a group in Ireland that wanted to borrow the schematics for the face-shielding paper bonnets her Ohio group wore. In Ireland, abortion is illegal under any circumstances unless required to save a pregnant woman's life. Thousands of Irish women seek abortion each year by traveling to Britain or ordering medication online. In the U.S., worries are building among reproductive rights advocates who fear the Trump administration could severely roll back access to abortion and other forms of women's health care. "The Handmaid’s Tale is a cautionary tale about a future without reproductive rights and the critical need to protect access to that care," said Danielle Wells, assistant director of state policy media at Planned Parenthood Federation of America. As the demonstrations continue to spread, and more women appear in statehouses dressed as handmaids, the red-cloaked allegory gets stronger. "Any limits to reproductive healthcare access, on birth control and abortion access, is essentially forcing women into pregnancy and motherhood," said Sherwood. "It’s limiting our futures and lives, so that we are only our uteruses and our reproductive ability."